Pinewood has unveiled plans for a dramatic redevelopment of its world-famous film studios. The £200m proposal includes a number of sets including a Venetian canal, Roman amphitheatre and street settings for London and central New York. Pinewood became famous in the 1950s and 1960s as the location of the James Bond and Carry On films. The planned site would be built on 100 acres of green belt adjacent to the existing studios in Buckinghamshire. 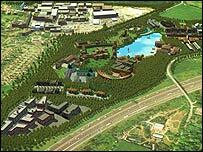 "This is an ambitious and exciting project that is of national importance," Ivan Dunleavy, chief executive of Pinewood Shepperton said. "Pinewood has been home to film and television for the last 70 years and this development will help secure growth for the creative industries for the next 70 years and beyond." There are also plans to build permanent backdrops for a British suburb, a replica medieval castle, a Los Angeles high school campus, Lake Como and a Chicago suburb, some of which could be visible from the M25. In addition, the proposal would create a "live-work" community, with plans to build a residential development of over 2,000 homes integrated with the film locations. Director Sir Ridley Scott has supported the proposed redevelopment saying: "I am tremendously excited to see the opportunities of this project realised on screen in future film and television production." It is hoped that Pinewood's plans could spark a resurgence in the British film industry and lure film-makers, who have been heading to Eastern Europe, back to Britain. Pinewood already has 20 film stages - including an underwater stage and the largest stage in Europe. Recent films shot at the studios include Charlie and the Chocolate Factory, Casino Royale and The Bourne Identity, as well as TV shows Extras and The Weakest Link.